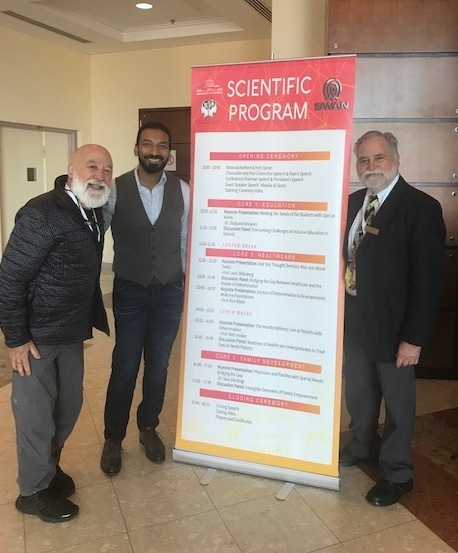 Dr. Rick Rader and Dr. Shuaib visit with Dr. Jack outside of the Scientific Program. After almost twenty hours of traveling, Dr. Jack landed in Dubai. From there he traveled to Sharja University to deliver his presentation at the local AADMD student lead program for medical, dental and other students and faculty. 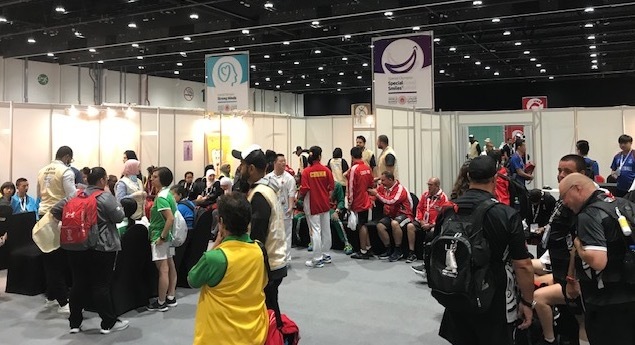 It was a wonderful opportunity to engage with local health professions students and witness their commitment to improving the health of people of determination in the UAE. The very successful event also brought together the AADMD leaders from America. Dr. Adams, the U.S. 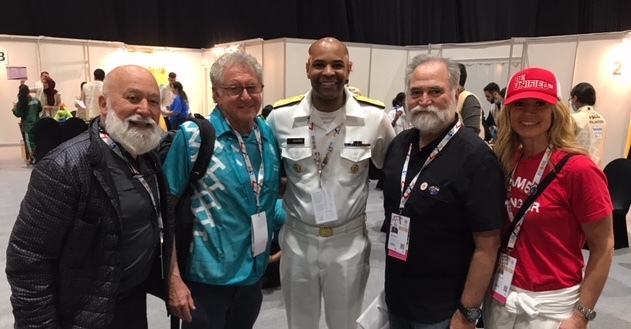 Surgeon General, visits the Dental Screening area of the Healthy Athlete Clinic. 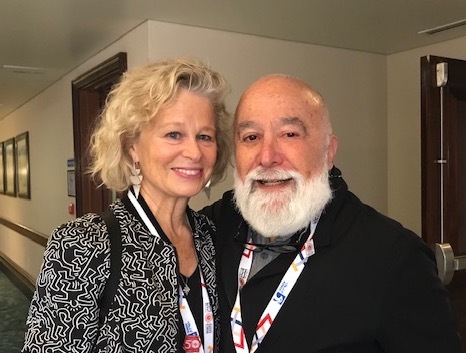 The Healthy Athlete program of clinics for the athletes, created by Dr. Steve Perlman, with oral health as the initial services provided, continues to be an incredible opportunity to provide multiple needed health services to the athletes. The opportunity to meet with various athlete coaches, former professional athlete supporters and the Shriver family was an added thrill. 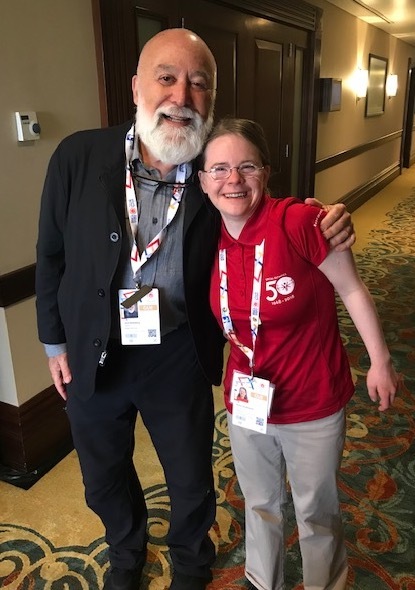 Dr. Jack attends the Global Inclusive Health Forum where inclusion of people of determination was the focus. 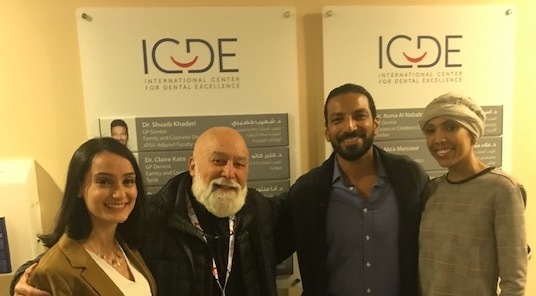 Dr. Jack visits Dr. Shuaib’s dental clinic along with his new wife Farha and office manager Natasha. Linda Shriver, Tim’s wife, takes a moment to chat with Dr. Jack. 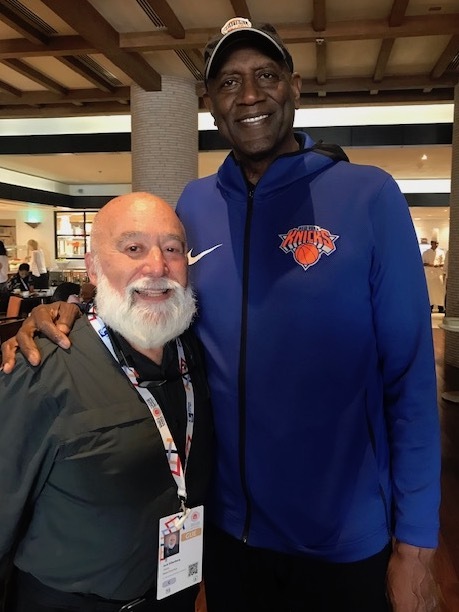 NBA Hall of Fame basketball player Spencer Haywood and Dr. Jack shared stories at breakfast. Dr. Jack Dillenberg looks forward to the new PDS Foundation Dentists for Special Needs, not for profit, dental clinic official opening on April 18th in Phoenix – located on Bell Road and 45th Street. It is a carefully designed well equipped facility to meet the oral health needs of those with special needs. Randy and Jack as they begin their presentation at ASAPA. 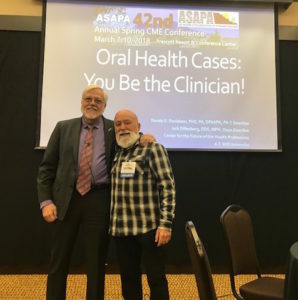 Dr. Jack Dillenberg joined Dr. Randy Danielsen at the Arizona State Association of Physician Assistants (ASAPA) annual spring CME conference held in Prescott, Ariz. They represented the Center for the Future of the Health Professions at ATSU. Their presentation focused on the integration of oral health and primary care. They presented clinical cases to the attendees and led a discussion regarding these cases. 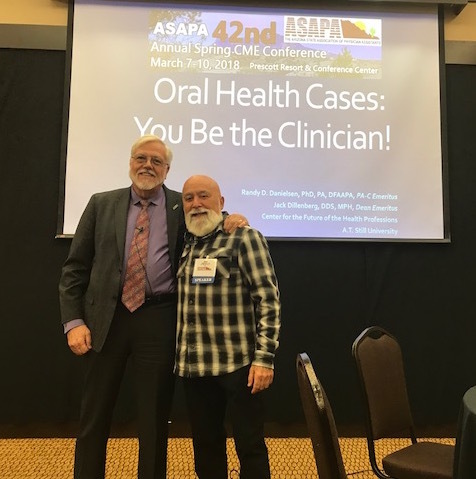 The PAs in attendance showed an interest in integrating oral health into their clinical practices. This included preventive as well as diagnostic work. Dr. Adam Bennett, ASDOH class of 2014, stopped by Jerome for a visit with his former dean. Dr. Ted Wendel joins Jack and Randy during their presentation. 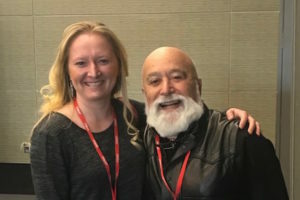 Ingrid, a member of ASDOH’s inaugural class, surprised Dr. Jack at the Yankee Dental Meeting in Boston. 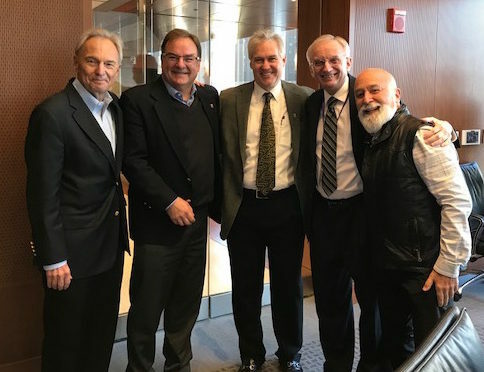 Winter weather did not deter Dr. Jack Dillenberg from heading East to speak at the annual Yankee Dental Meeting in Boston. 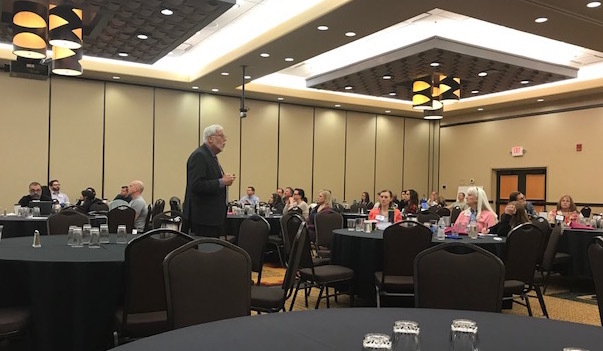 He spoke to a full room of community health center leaders and staff about the integration of oral health into primary care and the challenges faced by the 36 million Americans who are disabled. Dr. Jack joins staff and board members at their Brighterway Institute celebration. When he returned to Phoenix, he started his official role as board chair for the Brighterway Institute. He welcomed staff and board members to the winter celebration. 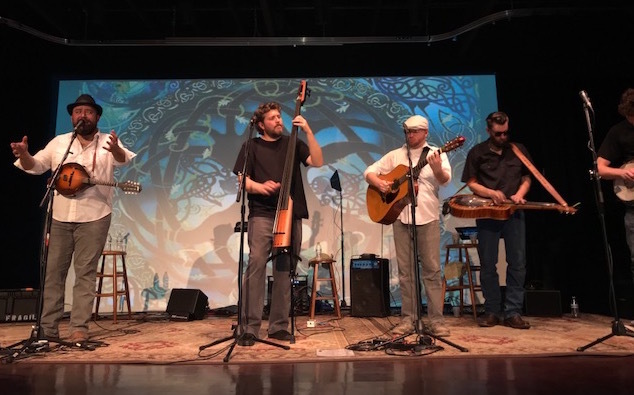 The famous bluegrass band, the Mountain Benders, performs at the Cottonwood Center for the Arts. 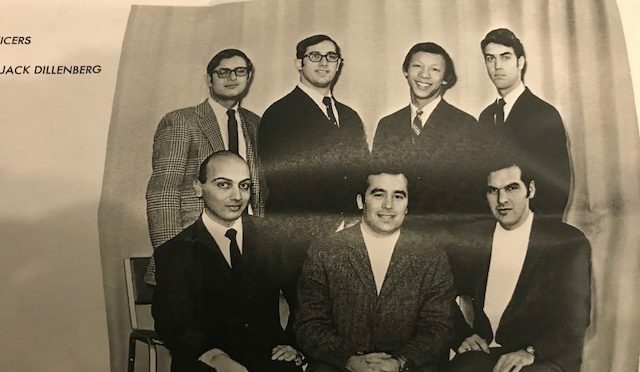 ASDOH faculty members, Drs. Maureen Perry and Scott Howell, speak on a panel about oral health care needs for the disabled. 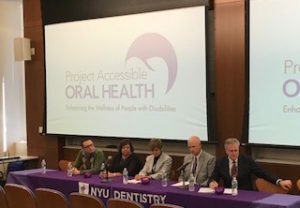 The Project Accessible Oral Health gathering in New York, brought together policy makers, clinicians, elected officials and others interested in improving the wellness of people with disabilities. The presentations described trends and innovative programs to improve overall health of children and adults with intellectual and developmental disabilities. 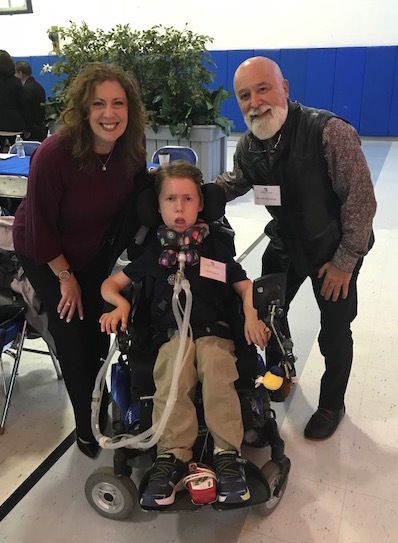 Dr. Jack had a chance to meet Dylan and his mom after their panel discussion. Individuals with disabilities, along with their family members, participated on various panels to share their experiences. During the two days, discussions included strategies for engaging and developing a network of advocates, funders and leaders. Participants showed a commitment to engage in the discussed strategies and plan to follow up with a second meeting in 2018. Participants of the Project Accessible Oral Health gather to share their thoughts about the upcoming meeting. Drs. 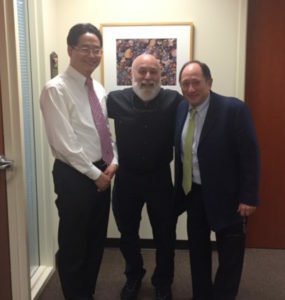 Jack Dillenberg and Jay Park welcome Dr. Elliot Moskowitz, a world famous orthodontist to ASDOH, who also happens to be a friend from Dr. Jack’s dental school days. The week began with a surprise visit from Dr. Elliot Moskowitz after his presentation to the orthodontic residents. 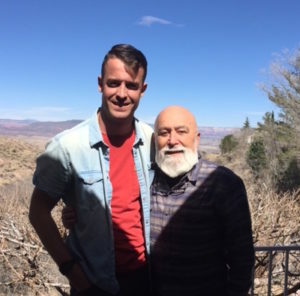 Dr. Jack Dillenberg had not seen Dr. Moskowitz since dental school graduation 45 years ago. 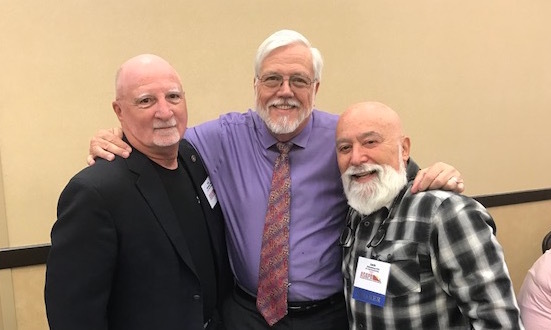 Later that day, Dr. Jack Dillenberg led the orientation for new Center for Oral Health Board members which included Joe Colaneri, Ph.D. , lobbyist, and Barbara Bartanian, head of the Pacific Dental Services (PDS) Foundation. 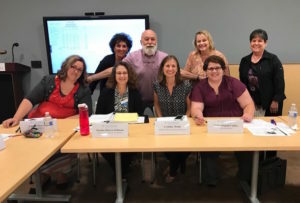 Tuesday, Dr. Jack Dillenberg attended his final First Things First (FTF) Southeast Maricopa Regional Council meeting where he served as the health representative for over nine years. First Things First provides preventive-oriented oral health for the children served by FTF. Dr. Jack bids farewell to his First Things First colleagues after nine years of service to the Southeast Maricopa Regional Council. 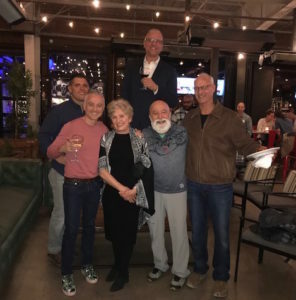 Dr. Jack Dillenberg joins Dentaquest leaders at the Oral Health for All 2020 meeting held in Phoenix. 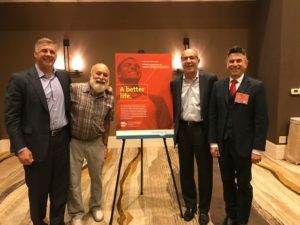 On Wednesday, Dr. Jack Dillenberg joined over 400 participants at the Dentaquest Oral Health for All 2020 conference held in Phoenix. Oral Health leaders from throughout the US were in attendance.